A couple of weeks ago we had a Georgian evening at our local tasting group, first tasting the wine, and later drinking it with Georgian food using recipes in the excellent book Tasting Georgia. All wines were purchased directly from Les Caves de Pyrene. Below I quote their standard retail prices, excluding the 10% discount I got for spending more than £200. They were all natural qvevri wines which, as discussed in my previous post, make up a small percentage of Georgia’s total commercial wine production. They were also made using skin-contact to varying degrees. 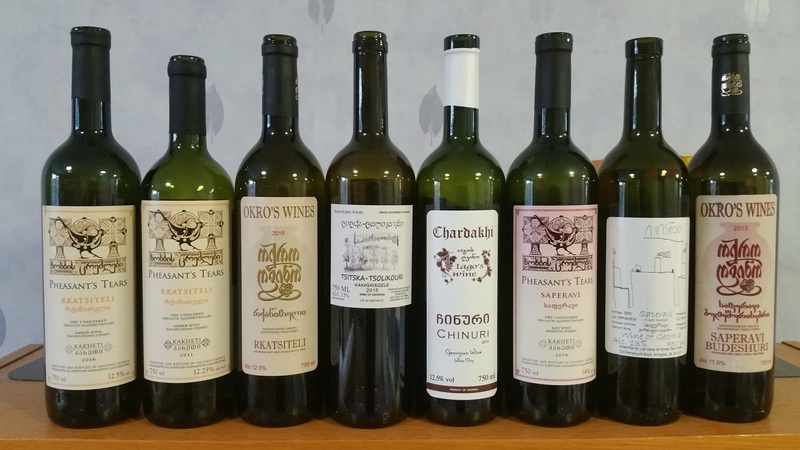 As this type of wine goes, I think the selection was fairly representative of what is produced in Georgia, with the emphasis on the Rkatsiteli and Saperavi varieties and the Kakheti region. I thought the wines all showed very well. I have had some of them before, when I did not enjoy them nearly as much. Is this the fickleness of natural wine, or were the previous examples faulty or served at the wrong temperature, or was it just me? Or maybe it was a combination of all those factors? For example, I think I managed this time to hit on a good serving regime, which you might want to reproduce… they were all taken out of my 12°C wine fridge, double-decanted, and then left in my garage at 15°C for one or two hours before serving. On this occasion, they all got at least 5 stars, while Okro’s Rkatsiteli, Iago’s Chinuri and Zurab’s Saperavi particularly impressed with 6 stars. Yes, I know they are very high scores, but I do not pretend to be objective – it was a good evening and I enjoyed the wines. That is the important message to take away. It could be regarded as pay-back time for the occasions when I was not so impressed by the same wines. Here are my rather sketchy tasting notes for what they are worth, in the order of tasting. Click on the image above for a hi-res view of the labels. From vineyards in Bodbiskhevi, around 3 km South-West of Sighnaghi, in the hills above the plains of the Alazani Valley. Medium amber. Intense, fresh, phenolic. Honey. Medium low acid. Dry. Orange. Medium low astringency. Medium amber. Intense, mature. Medium low acid. Tad cheesy perhaps, but it didn’t put me off. Medium astringency. Vineyards in Nukriani. Around 3 km from Sighnaghi, but further up in the hills, to the West of the town. Bright golden amber. Intense, fresh, fragrant. Medium acid. Dry. Gentle, subtle, rounded. Medium low astringency. Medium orange. Slightly sulphurous. Medium high acid. Medium high astringency. Lemony. Chinuri is the grape variety. 5,000 bottles, from 50 year old vines in the village of Chardakhi, around 20 km North-West of Tbilisi, in the southern part of Mtskheta-Mtianeti. Medium yellow gold. Medium intense, fragrant. Medium acid. Medium high astringency. This is from Tibaani, around 5 km South-West of Sighnaghi, just above the plains of the Alazani Valley. Tibaani is actually the name of a smallish appellation in Georgia but, as the name is not writ large on the label, I think the claimed appellation is the much larger Kakheti. Opaque purple. Medium dark fruit. Medium high acid. Medium high astringency. Fresh. Sharp and refreshing. From the Guria region, which has a Black Sea coastline. Medium pale purple. Intense, sweet berry fruit. Medium acid. Gentle, sweet. Subtle, spicy. Most Saperavi grapes have red flesh, but Budeshuri is a white-fleshed clone. The vineyard is in Manavi, around 40 km West of Sighnaghi, high in the hills, and possibly facing away from the Alazani Valley. Medium purple. Intense, fresh, sharp black fruit. High acid. Intense on palate too. Medium low tannin. Sharp and tangy. This entry was posted in My tasting notes and tagged georgia, natural, qvevri. Bookmark the permalink.